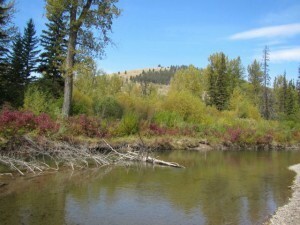 Monday, 9-14-15, was our transfer day from the Missouri River in Craig, MT., to Missoula, MT. This was also Trent’s birthday and it turned out to be a very special day. At one particular spot Bo pointed out a stump to son Trent and told him to drift his #10 Amy’s Ant down the inside seam coming off that stump. 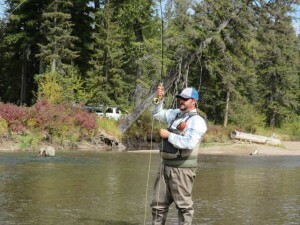 The fly had not drifted four feet when this beautiful Westslope Cutthroat Trout slammed the ant. 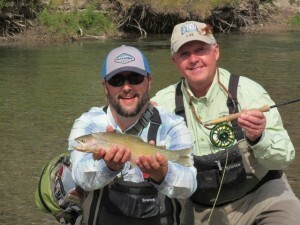 Your first Westslope Cutthroat could not be a better birthday gift for the birthday boy and his proud dad. 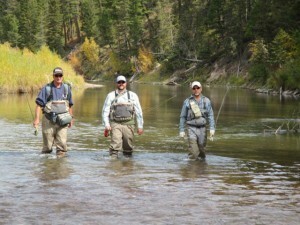 At the end of the day the three amigos from the left, Tom Hawthorne, Trent Goins and Bryan Dobbins wade out of the Blackfoot River. From there it was on to Missoula, MT., and a great pizza restaurant on the banks of the Clark Fork River for Trent’s birthday dinner.